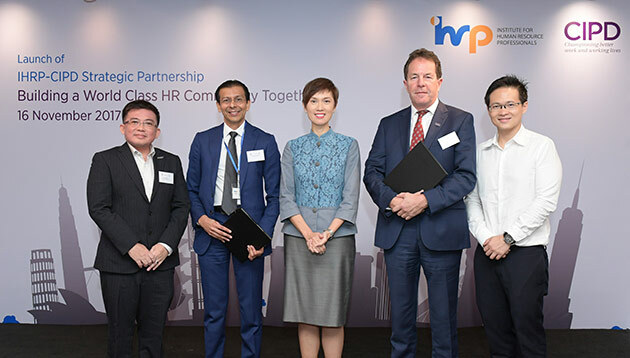 A strategic partnership between the Institute for Human Resource Professionals (IHRP) and Chartered Institute of Personnel and Development (CIPD) has been announced, with the aim of furthering the vision of a world-class HR community in Singapore. At the event attended by Human Resources, the memorandum of understanding (MoU) was signed on Thursday (16 November), making it the first mutual partnership of its kind in Asia. Certified professionals from the two organisations, upon fulfilling the agreed respective bridging considerations, will be able to attain mutual recognition from both professional bodies. Through IHRP-CIPD accredited courses, both organisations aim to develop HR professionals who possess a global, adaptive and future-oriented mindset. In addition, IHRP and CIPD will embark upon joint research projects and engage in the sharing of knowledge. The partnership will also see the IHRP Certification being recognised as a professional certification of international standing. Both bodies have body of competencies that are progressive and are reviewed on a timely basis. Both bodies trust each other’s systems for assessment rigour and their bridging methodology. Both bodies have somewhat similar eligibility criteria for each certification level. The signing was witnessed by Guest-of-Honour, Josephine Teo, minister, prime minister’s office and second minister for manpower and home affairs. “This partnership is the first step for IHRP to achieve our vision of a world-class HR community. HR departments have a very important role in preparing businesses and employees against the backdrop of business challenges brought about by global uncertainties and technology. We believe that the HR professional can positively impact the much-needed change in an organisation,” commented Mayank Parekh, chief executive officer of IHRP. From L to R – Stephen Yee, assistant executive director of SNEF, Mayank Parekh, CEO of IHRP, Josephine Teo, minister, prime minister’s office and second minister for manpower and home affairs, Peter Cheese, CEO of CIPD, and Desmond Choo, director of NTUC at the MoU signing.